Posted August 23, 2012 by Joel Goldman & filed under Indie publishing. If you follow my crime novels blog, you’re already part of the “indie” revolution that has totally disrupted how books are published. To say that things will never be the same is more than an understatement, it’s the gospel and it is good news. This is the first in a series of blog posts for those of you who are thinking about joining the revolution and going indie. It’s not about how we got here or where we’re going. It’s about how you can ride this incredible wave into the future. 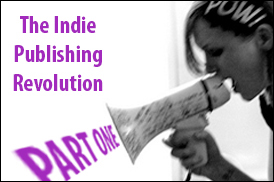 It’s about how you should approach self-publishing. What should your mindset be? What does it take to produce a professional quality book? What kind of commitment will it take to succeed? What are you willing to invest in your success and where should you make that investment? What I’m Not Going to Tell You! I’m not going to get down to the nitty-gritty of how to format an ebook for epub or mobi. I’m not going to explain how to create your ebook cover or how to upload your book to Smashwords, Amazon, Barnes and Noble or any of the other myriad platforms and I’m not going to walk you through creating an ad campaign for Google Adwords or any other kind of promotional campaign. Following these tips won’t guarantee that you’ll sell one book, let alone a million but it will help you to get your mind right. Success in this marketplace requires the same commitment and perseverance required for success in any other endeavor. There are no shortcuts. Just because you can self-publish doesn’t mean that you should or that you’ll become a bestselling author. If you’re not willing to give it all you’ve got, this isn’t for you. Between 2002 and 2010, Kensington Publishing Co. published eight crime books I wrote. Early in 2011, Kensington agreed to revert the rights to me for seven of my books. I always wanted to “go indie” but I didn’t know anything about self-publishing except that an author named Joe Konrath was making a crap load of money doing it. To get ready, I spent six months learning as much as I could from experts in the field before I released my first crime novel in ebook, format, Motion To Kill, in June 2011. Since then, I’ve sold over 100,000 copies of my backlist, recouped all of my start up costs and made enough money to fund my ongoing publishing and promoting without investing any additional money. I don’t say this to brag (well, maybe a little). I say it so that you can have confidence in what I’m about to tell you. These posts are a reflection on one of my basic rules of life. Know what you don’t know and if you need to know it, learn it from people who do. That’s what I did. It’s not the last word or the best word on the subject. It’s what’s worked for me. I hope it works for you. Earnest Gaines, the author of The Autobiography of Miss Jane Pittman, gave the best advice I ever heard or read about what it takes to be a successful writer – read, read, read and write, write, write. If you’re a reader but not a writer or vice versa it’s going to be an uphill climb. In addition to saying that you have to know both sides of the reading/writing experience, Gaines was saying that this takes a lot of work, that you have to learn from those who’ve gone before you and by the hard work required to learn the craft of writing. Unless you’re blessed or cursed with an unflagging certainty that you’re the next Hemingway (or Evanovich), you may have moments of doubt about whether you have what it takes, whether you’re talented enough. When that happens, check out a book written in 1938 by Brenda Ueland titled If You Want To Write: A Book About Art, Independence and Spirit. Ueland argues that, “Everyone is talented, original and has something important to say.” That gave me hope when I began writing in 1992. Her book remains in print, the latest edition published in 2010. Tired of Banging Your Head Against the Wall? When you grow tired of banging your head against your keyboard in the middle of your fiftieth draft, remember the words of President Calvin Coolidge who isn’t remembered for much but should be remembered for this bit of wisdom. Now what? Stay tuned for the next post in this series! Are you trying to go indie and finding it hard? Let me know and let’s get into a discussion. If everyone… in the world will want to be writers… my friend – our world will collapse from the chaos.. I'd add a little something. You may not turn out to be the author of the next best selling novel. But you might discover you're an inspired poet, a fine short story writer, a master of the monologue or have the perfect skill set for non fiction. Stay flexible, or you might miss your calling!